Today, my garden grew by 80 tomato plants…temporarily! Our school plant sale ended weeks ago; however, I have been watering the unsold veggies at the school every day since then. I have watched them go from dark green to pale green and yellow. Of course, I turned this into a teachable moment and showed my girls the difference between a healthy tomato plant and one that is weak and sickly looking. It was obvious, the plants were missing something; they were paralyzed in their little pots, just waiting with all of the potential to provide a summer of tomatoes, if given a chance. At one point, I considered throwing them in the compost pile just to put them out of their misery and get rid of the water chore. However, I could not bear to let them go to waste! So instead, I talked my three girls into helping me save eighty of these nutrient deprived tomatoes. The tomatoes are going to day camp. As a Master Gardener, we have to volunteer in order to maintain our Master Gardener status. 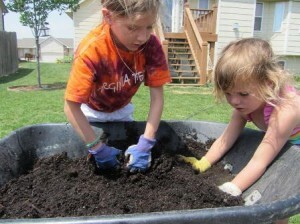 To gain volunteer hours, I have over the past eight years; lead an Extension Master Gardener day camp for kids in June. 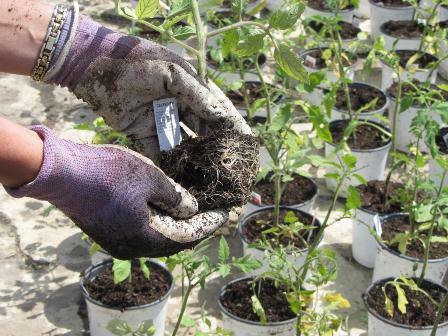 This year, the garden campers will take home their very own tomato plants. We will teach them how to care for their plant and the health benefits of eating tomatoes. We could all probably benefit from eating more tomatoes as they are full of antioxidants and vitamins. My goal is to deliver healthy tomato plants to the kids at day camp. 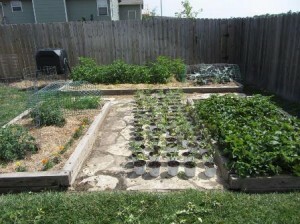 In order to do so, we stared by transplanting them into a nutrient rich potting soil. I bought potting soil that already had a slow release fertilizer in it. This will ensure that our weak transplants would get the much needed N-P-K. Within a couple of days, the tomatoes should be green again. I am also going to water with a root stimulator to help reactivate the plants growth.